Best of Adopting a Cat < Shelter, SPCA, humane society, or rescue? Shelter, SPCA, humane society, or rescue? You’ve researched what type of pet would be the best match for your lifestyle, read up on training, pet-proofed your home, even tossed around a few name ideas. Your schedule for the next few weeks is open. You are ready to adopt a pet! You can see thousands of pets on Adopt-a-Pet.com from your local shelters, humane societies, and pet rescue organizations. But before you click on that irresistible furry face in the search results, do you know what is the best type of pet adoption organization for you? While they vary tremendously from community to community, here’s some information about the different types of pet adoption organizations to help you know what to expect from each type. Informed adoption is a better experience for everyone. And wherever you adopt, you will be a homeless pet hero! Your local city shelter could be called Animal Services, Animal Control or even “the pound” — but get that depressing and dated Lady & The Tramp image out of your mind! It is true that many large city shelters, like those in Los Angeles, Detroit, Houston are overwhelmed with the numbers of pets coming in. 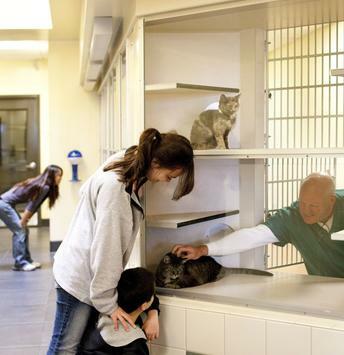 If they have an “open door” policy that means they do not turn away any animals, but that also means as more pets come in than get adopted or found, they put animals to sleep to make room. While that fact is depressing, many modern shelter facilities themselves are bright, clean, and inviting, and the pets are ever optimistic that they’ll be one of the lucky ones — that they’ll be adopted by someone like you! Before you adopt from a city animal shelter, understand that most city shelter pets have an unknown history. Bring your entire family and spend plenty of time with the pet you want to adopt, outside of their kennel, like in an adoption office play yard, or even just a hallway or lobby. Many shelters have volunteers that help the adopting public, but most have little to no formal screening process — it is up to you to select a pet that will be a good match for your home. Be prepared for learning about your pet after you bring him or her home. Be prepared to possibly need the help of a trainer or adoption-experienced friend to help you through the normal adjustment of a new pet in a new home, especially if you have other pets or children. Also, take your new pet to your vet for a full checkup, and understand you may have to help them get through a common shelter cold in the first few weeks. Did you know that Humane Society and SPCA are just descriptive words — like the word ‘bank’ is in US Bank and Bank of America? They are all independent organizations, not connected to each other. It can be confusing! Many people even mistakenly think that the Humane Society of the United States runs all humane societies. They do not! They do help animals like through legislation and in disasters, but do not have a shelter themselves. Some humane societies and SPCAs are “limited admission”. That means they do not have to euthanize animals to make room. Others, are “open door” with animal control contracts, just like a city shelter, so they do euthanize to make room. Aside from if that makes your heart ache when you visit, it may affect how much they know about their pets. Limited admission organizations often have their animals for many months, and use foster homes. Many “open door” humane societies run programs that have helped reduce pet overpopulation in the cities they serve, they may have the pets for many weeks, and know more about their behavior and health than a city shelter. Or they could be exactly like a city shelter, overwhelmed and holding pets only a few days. Adoption fees vary greatly! In Southern California, they range from $20 to $325. A rescue can be a private citizen or a non-profit organization. They vary as much as stores vary from one to another! Rescues are typically “limited admission” and use foster homes or boarding kennels. Because they pour so much time, love and money into their pets, their adoption fees generally range from $150 to $400. They will usually have you fill out an adoption application, conduct a phone or in-person interview, and ask to visit your home to evaluate it for the safety of the particular pet you’re interested in adopting. The price & process may sound like a lot, but in return you typically get a lot — a pet who’s behavior and medical history is well-known, after-adoption support with training, and a solid return policy should the pet surprise everyone and not be a match for your home. But since each rescue is so different, make sure to ask about their policies. You can find your local rescues, humane societies and shelters at www.adoptapet.com/animal-shelters and you can use Adopt-a-Pet.com to search for pets for adoption at all these types of organizations using a mile radius from your zip code, and your desired breed, gender, size and even color. And since you now have a better understanding of the differences between the types of adoption organizations and know what to expect, you’ll have a better experience adopting your new pet!